The Bantams of 14th Battalion were disbanded on 11th February 1918, and the survivors, some 250 strong, were transferred to 13th Battalion. On 20th February, 2/4th and 2/6th Battalions were also disbanded, their surviving personnel transferring to 2/5th Battalion, The Gloucestershire Regiment and 24th Entrenching Battalion. 10th Battalion had already been disbanded in February 1917, its survivors transferring to 1st and 8th Battalions, and 13th Entrenching Battalion. “. . . At another point the Germans thought they had surrounded a platoon of ours and called on them to surrender, but instead our men counter-attacked, cut off a section of the Germans, and took them prisoners in turn. Not far from a Festubert a party of Gloucesters were entirely surrounded, and once more asserted their right to be the regiment which fights both ways and wears its badges aft as well as forward. “All along this extreme southern sector, indeed, the combat was of the most sanguinary character. The Germans everywhere came on in wave after wave, and before the remnants finally ebbed and flowed back their losses must have been very heavy. ” . . . saw Bosches dribbling up hedge on left: the fun begins. A swarm (of enemy) appears on right coming through gap in hedge. Spare Lewis-gun lets rip. No. 1 (Cotham) gets severe wound in face – Holbrook carries on. “The Vickers gun now picks up Bosche machine gun and knocks its out. Plenty of work with glasses for me – dozens of Bosche light-machine gunners picked up by glasses and crews knocked out. Frontal and right flank attack fails by 9 a.m.
“9 a.m. Corbett asks for assistance as Bosches have swerved to his left and are now in great numbers in front of him. Give him spare Lewis-gun and crew, and L/Cpl. Brimble’s section. We are holding them well now. Return to 16 Platoon and find L/Cpl. Barnett and section firing at Germans who have got about 500 yds. away. Spare Lewis-gunners and Platoon H.Q. open fire on Bosche getting through behind us. “Bosche in front now have ‘wind up’ – afraid to show a finger – the boys snipe continuously. Can give more attention to rear now. “Noon. Bosche attack has become hopelessly disorganised – attack at a stand still. Planes came over and they put up white lights. 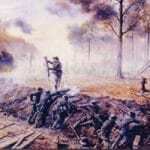 “2 p.m. Enemy retire in confusion, throwing rifles and equipment as they run, helped along by our artillery and my boys. “4 p.m. Their Dressing Stations appear: enormous number of Bosche wounded and killed. The German offensive ground to a halt on 18th July, and the time was right for the final Allied offensive to begin. 1st Battalion saw action at Fresnoy in September, the St Quentin sector in October, and fought their last action of the war at Catillon on 4th November. 8th Battalion fought their last battle near Les Fourrieres after crossing the River Selle in late October. 12th Battalion with 5th Division had returned from Italy in time to take part in the battle of Lys in April, and fought their last action during the battle of Albert in late August, before being disbanded on 6th October. The last battalion of the Gloucestershire Regiment to be mobilized was the 18th which did not arrive in France until August 1918. 18th Battalion saw some action towards the end of that month and again in September, but spent the rest of the war in Reserve. In Palestine the Royal Gloucestershire Hussars ended the war, 156 strong, on outpost duty outside the recently captured city of Aleppo. An armistice had been concluded with Turkey on 31st October. 7th Battalion, The Gloucestershire Regiment were at Kazvin in Persia on 31st October, and the following month would go on to Baku on the Caspian Sea before finally leaving for home via Constantinople in August 1919. “On January 29th 1918, I was discharged and went home to await my turn to go to Roehampton for an artificial arm. On my way home I had to wait a couple of hours in Bristol and was surprised to see Else and George as well as Monty waiting for me. When I got home I found Mother not very well, but Ada was fairly well. Mother did not get up much after I got home. Her cough got worse and she died on Sunday April 14th 1918. Picture: Private Miles capturing the machine guns single-handed.